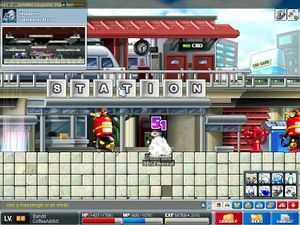 Singapore is accessible by purchasing a plane ticket from Irene for 10,000 mesos and boarding the plane located at Victoria Tree Platform. You will land at Singapore's Changi Airport and exiting the current map will bring the player to the first town of Singapore: CBD. 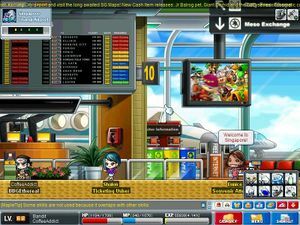 In GMS, the ticket costs 300,000 mesos, but you are instantly transported to Changi Airport instead of boarding the plane. You will also be able to transport there via Spinel the World Tour guide. This is the landing area where newly arrived players appear after their flight. It has a very modern feel, and lists many potential destinations, though none are available yet except Victoria Island and Orbis. The CBD (Central Business District) is the first town in Singapore. This area features some famous Singaporean landmarks, like the Merlion, Statue of Sir Stamford Raffles and Esplanade. An NPC sells many local delights of Singapore here. Some examples are Laksa, Durian, Hokkien Mee and Chilli Crab. There are two exits in CBD. The portal to the right is linked the Central Way, and the portal to the left links to Singapore Airport. 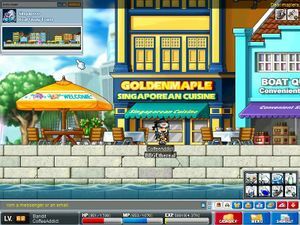 In GMS, there is an NPC named Audrey that takes you to Malaysia. 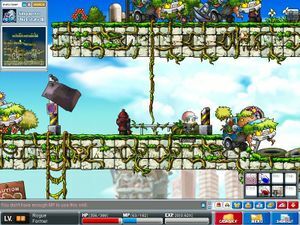 Level Range (MSEA and other versions): 18-33. This series of maps are between the Central Way Town to Boat Quay Town. ERP Gantries can be found here. The monsters here are the weakest of all. Biners, Batoos, Stopnows and Nospeeds live here. Level Range (GMS): 149 and 150. This series of maps also are between Central Way Town to Boat Quay Town. MRT trains and ERP Gantries can be seen in the background. Monsters found here are ordinary suburban objects, like fire extinguishers, being carried by the suspicious black slimes. There are also Truckers which are one of the monsters which are driven by black slimes. It serves as the primary hunting grounds for the CBD. A portal in Suburban Area 2 leads to Ulu City. Level Range (MSEA and EMS): 43-100. This is the second town in Singapore. 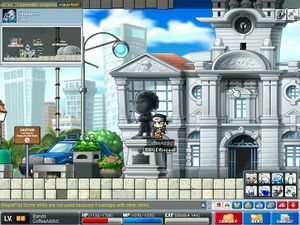 A player walking from the CBD enters the town from the left. It has the same things as most other towns, and the streets are lined with restaurants. This town is much less populated than the CBD, but still fairly active. The main hunting grounds outside of this town are the Mysterious Path, an area leading up to what might be called Singapore's Dungeon, the Ghost Ship. The monsters here are stronger. Boat Quay Town is also connected to Trend Zone Metropolis in Malaysia. This area is a walkway from Boat Quay Town to the dungeon of Singapore, Ghost Ship. These maps have boats hanging to each other which can create path. The monsters here are Octobunnies, Tippos and some low level sailors. The path is divided into 3 maps, Mysterious Path 1, 2 and 3. Mysterious Path 3 has a whopping spawn rate of Selkie Jr. and Slimys on 3 lanes, and is a supreme training ground for level 140s to 150s, and possibly other level ranges too. 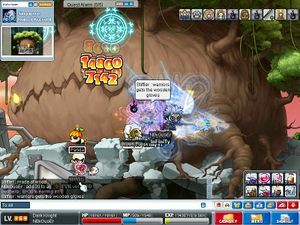 Only available in MapleSEA and EuropeMS. This mini-dungeon is located in Mysterious Path 3. It was used to be a rather big map which contains 2 monsters: Selkie Jr. and Slimy. However, after the v0.73 patch, the map was shrunken slightly, making this map slightly better. This is the "dungeon" area of Singapore. The Ghost Ship is a tough area populated by undead sailors, with various seafaring items as weapons. Because of that, many sailors, namely Ralph the Wanderer, was forced to quit their job and leave the ship. 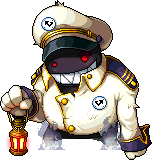 At the Engine Room, the Captain can be found, a level 100 boss named Captain Latanica. This is the most recent expansion of Singapore. In Singapore, the term "ulu" means "abandoned or deserted," a fitting name for this city that lies in ruins. It looks a lot like the other regions of Singapore, but the ground is overgrown with tree roots and many of the buildings in both the foreground and background are crumbling away. It's a powerful area with monsters ranging from level 160 to 167. It has three main sections: Destroyed Park, Ruins of Krexel, and Ulu Estate. At the entrance, there are the black slime monsters carrying trees over their heads; slightly further in, and one encounters the last human occupant, Commando Jim. This area can be reached by walking from Suburban Area 2, off the CBD. These appear to be apartment complexes that have been overrun with monsters and nature. Broken down cars and fallen light poles litter the ground. The main enemies in the first map are giant beetles with the black slimes hanging from their legs, the Veetron. Additionally, enormous worms called Slygie will burst forth from the ground once in a while. Beyond those are cars that have become so overgrown that the trees have taken them into themselves and begun moving around, called Montrecer. Approaching the Ulu City, the maps are occupied by new concrete behemoths that lumber about, the Petrifighters. In the abandoned city, there was once a beautiful park. 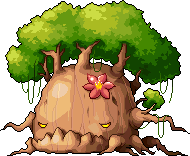 However, with the city in ruins it decayed rapidly, and is now the home of colossal tree monsters, the Duku. They can somehow move, and lurk through the park with great malice. 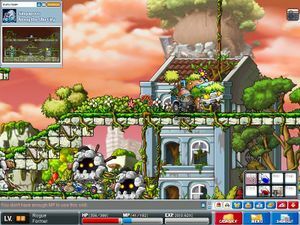 Only available in MapleSEA, GlobalMS and EuropeMS. This mini-dungeon is located in The Destroyed Park II. The map contains only Duku. It's a giant tower that's completely filled with tree roots. Players will have to climb the tower while avoiding wires, gas tanks and bees. At the top, an enormous tree pokes through the roof, somewhat resembling a giant Deku. The name of this area is derived from a mysterious boss called Krexel. This page was last edited on 16 February 2016, at 07:12. This page has been accessed 312,920 times.